Oh, the beloved concert tee. I had a drawer, no wait, drawers full of those things. Flex your DIY muscles and fashion your old t-shirts into a tank style that is new and fresh. All you need is a pair of scissors! Expand your workout wardrobe by transforming those unused tops into a twist back muscle tee. And, as a bonus, you can revamp oversized tees into a trendy tunic by snipping away the sides and then tying them together. To add the final touches simply alter the neckline with a swift swoop of your scissors. This style is perfect for gym junkies that like to look cute while hitting the weights. 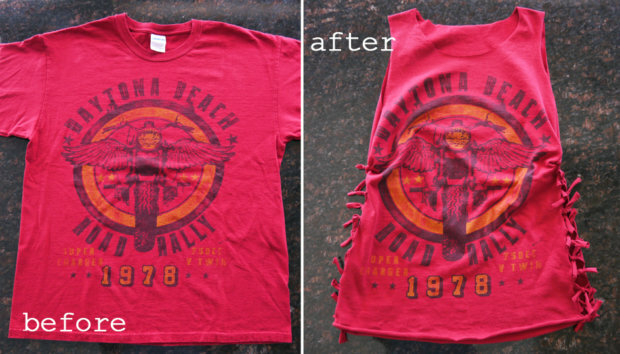 Break out the scissors to make your shirts more interesting!